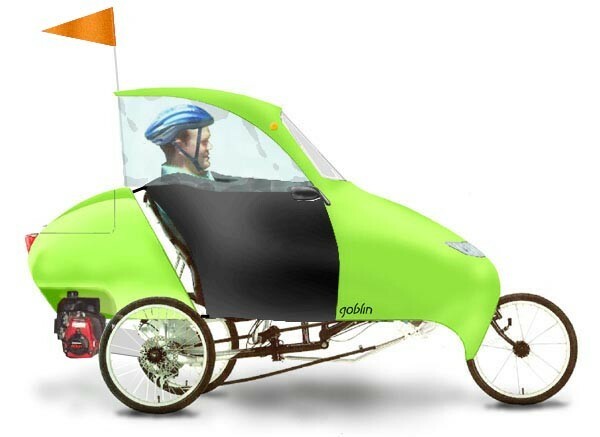 Goblin Motors, based in Arizona, USA, has introduced a new tricycle, named ‘GoblinAero’. Thanks to the vehicle’s hybrid engine – utilizing both electric power and traditional gas – it enables drivers to travel ecologically, consuming only 150 miles per gallon. The GoblinAero features a slide-out seat, which can be adjusted to fit a variety of riders, allowing a number of people to use the same trike. According to its manufacturer, the GoblinAero features one of two motors: Honda 35cc or Honda 50cc. Staton Drive gearbox is standard, allowing travel at 30mph on flat roadways (rougher terrains might involve slower speeds). One advantage the GoblinAero has over other similar vehicles is non-puncture tires, ‘road-proofing’ one’s travel. In order to maintain balance, Goblin Motors has installed extra wide wheel stance, thus creating a low center of gravity. However, it is still narrow enough to fit through doorways and cruise in bike lanes. The main feature the GoblinAero has is its miles per gallon ratio, speficied at 150:1. However, a fill-up is 0.28 gallons, which is sufficient for only 30-40 miles; as a result, consumers interested in ‘green’ vehicles that provide longer rides might have to choose another trike, or some other means of transportation. Currently the GoblinAero is priced relatively high, at $5,995 (including the engine). Various upgrades, accessories and additions are available, but obviously these increase the price. TFOT has previously covered the BRP Spyder, a three-wheeled vehicle that offers more stability in comparison to motorcycles, and Enertia, an electric, ecological motorcycle made by Brammo. Other related TFOT stories include Twill, a commute car concept that utilizes a two-wheel-in-line dynamic balancing technology, and TH!NK Ox, a five-seater, fully electric car that can accelerate from 0 to 100km/hr in less than 8.5 seconds. For more information about the GoblinAero, see its website.